In this tutorial we'll create make a Dock menu using CSS3 attributes. The Following example will only work with the following browsers only. The Dock is a prominent feature of the graphical user interface of the OS X operating system. It is used to launch applications and switch between running applications like the taskbar in windows. The Dock is also a prominent feature of OS X's predecessor NeXTSTEP and OpenStep operating systems, and the term "dock" is sometimes used generically to refer to similar features in other OSes, such as RISC OS's icon bar. This dock make use of –webkit for the transition purpose, this does not need any java script or jqurey. This is a simple easy to install menu like an ordinary This dock make use of –webkit for the transition purpose, this does not need any java script or jqurey. 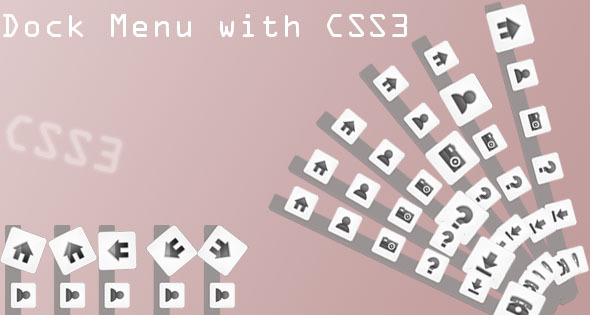 This is a simple easy to install menu like an ordinary CSS menu.